Serviced apartments are significantly cheaper than hotels. This is the result of our recently published comparative study of long-term stays. In the DACH region, guests were able to save an average of 32 percent in 2017 when staying in serviced apartments instead of in a regular hotel. For our analyses, we used apartment prices from around 30 cities and compared them with HRS average hotel rates*. 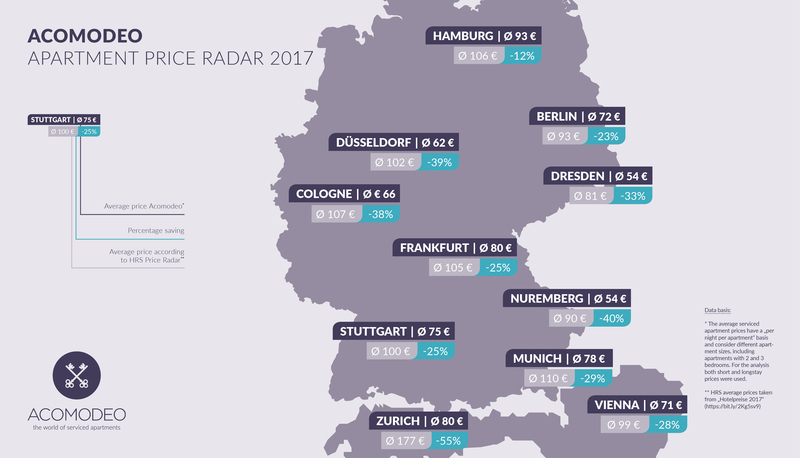 The largest savings were recorded in Zurich (55 percent), Nuremberg (40 percent), Dusseldorf (39 percent), Cologne (38 percent) and Dresden (33 percent). 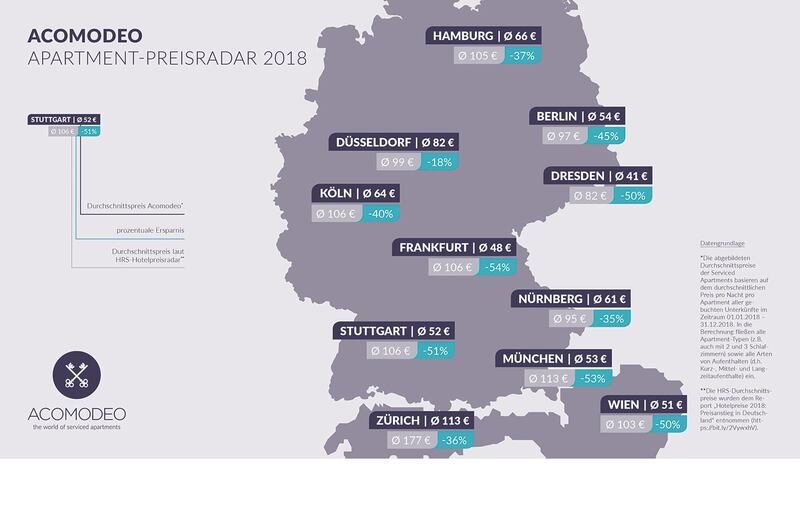 However, substantial savings were also found in Munich (up to 29 percent), Vienna (28 percent) and Stuttgart (25 percent). The decisive factor in the price comparison is the so-called degressive price model, which reduces the price per night as the length of stay increases. Thus, bookings for a longer period of time in particular are competitive with a regular hotel. Still, far too many business travellers choose the tried and tested but mostly uncomfortable and more expensive hotel room. The reason is, besides a lack of knowledge of the product "serviced apartments", it is a confusing and fragmented market. Due to a lack of understanding of long-term stays, offers are chosen that are neither designed for apartments nor for long-term stays - hence, companies usually pay more! Our price analysis is therefore a powerful positive argument for the entire, rapidly growing segment of serviced apartments. If you are interested in the product, we support you with our portal, which, in addition to pre-negotiated rates and numerous services, offers an infrastructure that is specially designed for serviced apartments, as our CEO Eric-Jan Krausch comments in our latest press release. The results of our study were also presented to industry representatives and decision-makers in the apartment sector during the Serviced Apartment Sales Bootcamp (SaSaBoo 2018) organised for the first time by Acomodeo. Our kick-off event, which took place in Frankfurt am Main at the beginning of June, offered insiders plenty of time and space to verify and discuss the study data and also to exchange knowledge and experience. Serviced apartments offer the best of both worlds: The freedom and comfort of a furnished apartment as well as the security and service of a hotel stay. A fully equipped kitchen or kitchenette is just as important as a separate living and sleeping area, which usually also has a desk and WiFi access. A big plus for long-term guests. The serviced apartment market has seen continuous growth over the past 15 years. The entire industry reports more than four million overnight stays annually in Germany alone. With increasing awareness of the industry as well as the enormous savings potential of travel managers, it is to be expected that this number will continue to rise. Moreover, budget providers pouring onto the market are serious competition for established apartment operators and are driving further price developments. For this reason, we will also monitor and reflect trends in price developments in our next price radar. Within the scope of the evaluation, the average price per night per room found in the HRS hotel portal was compared with the average price per night per apartment in the Acomodeo portal. The apartment analysis included serviced apartments of different service levels and sizes - including apartments with two, three or more bedrooms. The aim is to make future evaluations even more detailed.